- a focus on seven core communicative functions (called out with icons throughout the program) and the grammatical structures that support them. These functions are constantly recycled throughout the program to reflect the real-life use of language. - meaningful communicative practice through writing and speaking activities presented in a real-world context. In Connect, our composition and peer editing tools along with our Blackboard IM and VoiceBoard tools allow students the opportunity to have communicative practice with their peers outside the classroom as well. Connect is the only integrated learning system that empowers students by continuously adapting to deliver precisely what they need, when they need it, and how they need it, so that your class time is more engaging and effective. - constant recycling of grammar and vocabulary throughout the program using the seven communicative functions, Para repasar boxes, Pruebas diagnósticas, and the LearnSmart suite of tools. - cultural content in the form of new ¡Cuéntennos! videos and the ¡Viaje conmigo a… videos as well as readings on art, music and history serve to recycle grammar and vocabulary and to enrich students' experience of language learning and provide a window into Spanish-speaking cultures. 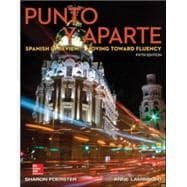 These features support the core goals of the intermediate Spanish course and put students on a successful path from simple utterances to more extensive discourse, from sentence-level to paragraph length expression. *Connect Spanish, including but not limited to the workbook/lab manual, LearnSmart, the video program, and chat tools, is sold separately and does not come automatically with the purchase of the textbook. Nota cultural: ¿Somos tan sensibles? ¡La quiero mucho, pero me vuelve loco! Nota cultural: ¿Quiénes son los más fiesteros?